Building on the success of his bestselling Foreign Exchange Options, Alan Hicks has produced this new and invaluable guide to the use of currency options for corporate treasurers and other financial executives. Setting the principal OTC instruments within the company’s risk management framework, he provides an authoritative guide to the characteristics, advantages and uses of currency options in the management and control of foreign exchange risk. 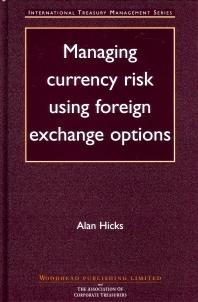 Alan Hicks’ unique experience allows him to concentrate on the practical application of options as experienced in the real world of foreign exchange, illustrated by the use of case study material throughout the book. Illustrates how FX options are derived from the underlying FX markets. Short history of foreign exchange options; The basics; Option characteristics; The market-place; Put-call parity; Option pricing; Using options for hedging: Simple; The delta and option replication; OTC market practice; Bank relationships; Using options for hedging: Intermediate; Risk control; Documentation; Counterparty credit risk; Appendix I Currency codes; Appendix II London Code of Conduct; Appendix III Exchange contract specifications; Appendix IV International OTC market terms and conditions. Alan Hicks began his banking career with Royal Bank of Canada with subsequent moves to Fidelity Bank, Chase Manhattan and Standard Chartered Bank. In 1996, Alan formed his own company – Options Training and Consulting Limited – offering advice, training, education and support in all aspects of options. Also in 1996, Alan entered into an alliance with Inventure Ltd and conducts all UK training and consulting business under the Inventure Ltd name.